Southern Matriarch: What is strange in this picture? You can see the top of the cutting table! It feels great, so great that I am anxious to get in there and get to work on something. Anything. Along the back of the table on the left is my Wee Care basket, which right now is woefully under supplied. I keep cut out, constructed, waiting to be smocked Wee Care gowns in it at all times. In the center is a pillow I made from a class project from SAGA convention a couple of years ago. On the right is a pile of UFOs that I don't want to get buried somewhere. Now lest any of you run screaming from the room under the mistaken impression that these are all of the UFOs I have, please rest easy that this is a TINY pile of a FEW of them. I have a double cabinet and a couple of containers in the double closet full of UFOs as well. These are just the ones I want to get to soon. I had to go buy a new seam ripper from all of my trails of last week. How sad is that? I had to chuckle at myself today when I was vacuuming. To vacuum is a 3 step process. You have to first sweep the carpet. Yes I said sweep. So many tiny bits of seam clippings, piping ends, tracing paper scraps, interfacing scraps etc etc to pile and scoop up first. Then I used the nozzle to get as many loose threads as I could before I used the vacuum so that I don't wrap quite as many around the brushes in the vacuum cleaner. Why go through all of this you ask? I have a child who when she comes home thinks it is her responsibility to clean house. Her mother doesn't do a good enough job I guess and I am not going to sway her opinion. But she has this nasty habit of getting grumpy while she does it. One of the things that makes her really cranky is threads wrapped around the brushes of the vacuum. Is this the same child who tried to vacuum up a petrified peanut butter and jelly sandwich found under the bed? Who didn't wash her uniform skirt her entire senior year of high school on a dare? Who thought that the only way to clean a bathroom was to throw away a year's worth of empty shampoo bottles she has stashed in the vanity instead of throwing away? Could this be the same child? So just to please her when she comes home, I go through this lengthy process to vacuum the sewing room. Perhaps she'll notice. Now I am off to mend a stole for my husband, a tie for my son and finish off two Wee Care items I stitched in the car yesterday on the to and from the fairgrounds. Martha...looks nice and clean. Must be time to start a new project!!! I keep a basket of on-going wee care projects too...I probably wouldn't get many done if I did not. Thanks Cindy, I agree it is time to get something else to work on. I found an old class project to finish up. Our chapter is doing a doll auction in the fall, I found an 18" doll dress class project. Hope to finish it tomorrow. 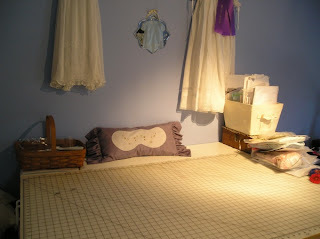 Dude- I saw the picture (and the one on the first post) and thought- damn, the sewing room looks really clean.